A quiet morning with nothing on the list but cleaning… so when I went to let my chickens out into the 7˚ weather, I decided I’d sneak into my studio. Minutes later, a fire is in my wood stove and an extra heater is plugged in. I had grabbed my GoPro thinking I’d try an experimental time lapse of me drawing… and the battery was dead. I hadn’t hardly done anything with it, so I must have it on a wrong setting or I didn’t really turn it off! So much for that experiment. Then I moved onto something practical, nailing trim boards on my ceiling. Within minutes, Vernon shows up and asks me to accompany Brandon to the badlands. Vernon is still “off” from his bout with stomach flu and Daniel is staying home because Tess now has it! I’m so dreading when I catch it! Anyway, I said I’d ride along for backup and gate duty. 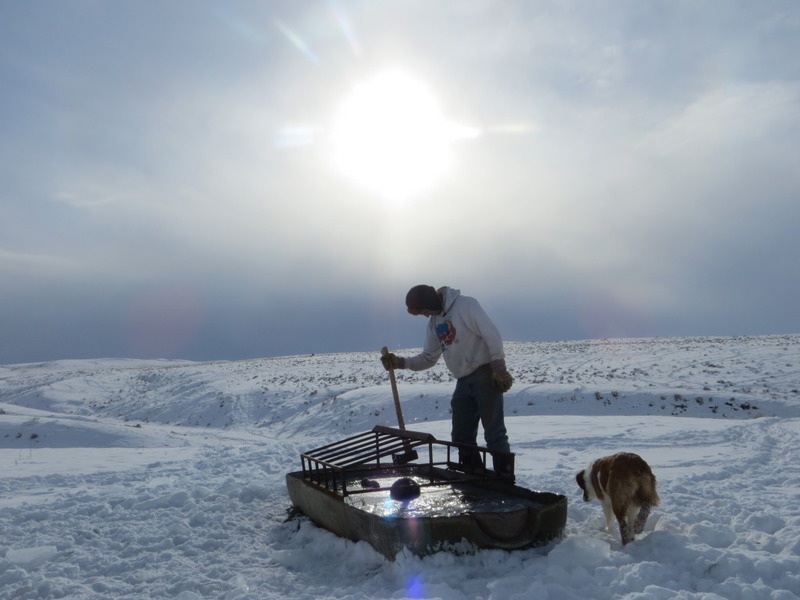 The badlands trip is on a rotation with everyone who has cows out there… Every day someone has to go out to the scattered water tanks and break the ice. While the water flows through the pipeline… and it’s warm enough underground to keep it from freezing, there is no heat at the tanks, and overnight they can be frozen with 4″ of ice. The second one we came to had a problem. The float, which is what allows the water to fill the tank, had a hole in it. Brandon fortified it with empty water jugs from the pickup, and refilling some air in the float. Needless to say, his hands were painful when he finally finished tying knots under water! We covered many miles… and only had to retry two hills because of the deep snow! The next storm stayed along the horizon most of the day… giving the sun a watercolored effect. We made it within a mile of home before the snow really started coming down, and counted ourselves lucky. 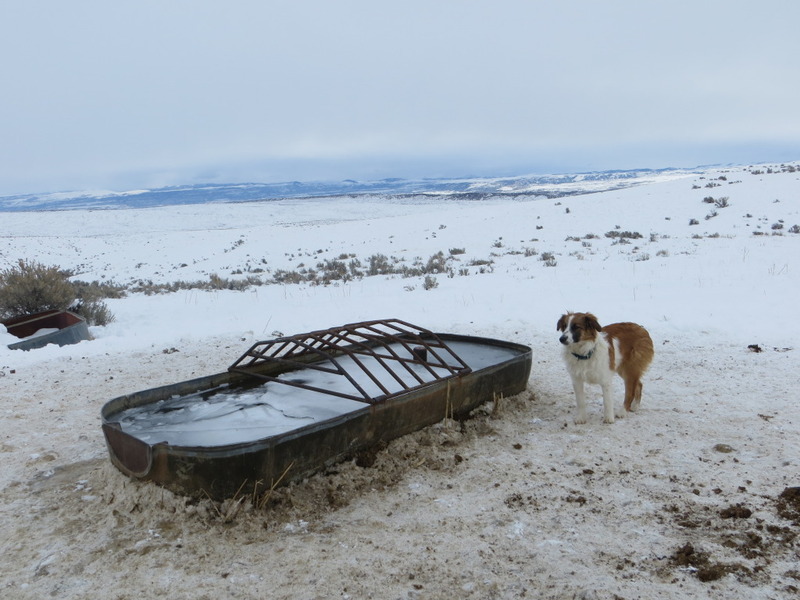 Six more inches out there will make it tough going for a pickup… Snowmobiles will be the way to go… and if the wind doesn’t clear the ridges, we may be bringing the cows home soon. Wonderful photos that really give a sense of the landscape in winter. I am back home is sunny So Cal, but my memories of your piece of heaven are strong. Such an amazing place you live – even in winter! It’s a gift to be able to be out, even in the freezing weather. Thanks for sharing, and good luck with the GoPro!! Can’t wait! This makes a person appreciate that pound of hamburger in the market. What a gifted person you are Carol. 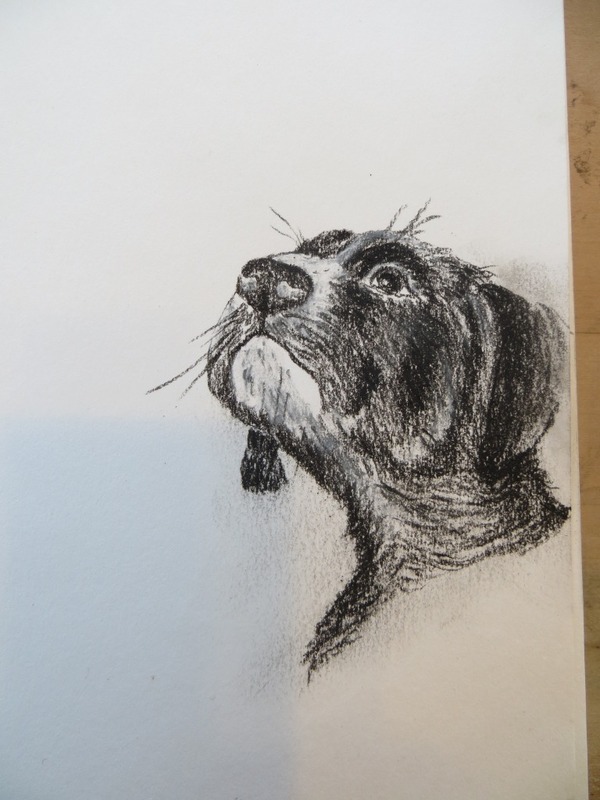 A wonderful black and white drawing. Love the photo of Daniel with the sun behind. Like you a new camera for Christmas. Just a few more ‘things’ on it from the one I’ve had last seven years. Need to check online manual. Hope you keep free of stomach flu. My friend always increases hand washing before and after almost anything if someone is sick in her family.